Andrew Chambers was born and raised in the San Joaquin Valley and comes from a family of farmers and educators. He received a B.F.A. from the San Francisco Art Institute in 1976, and an M.F.A. in post-studio art at Cal Arts in 1979. Andrew has traveled extensively in North, Central, and South America, and Asia. A militant reader and utilitarian, Andrew has had over forty group and individual gallery shows, and his earlier "experimental" film work (in the 1980's) screened in various venues across America including the Collective for Living Cinema and the Millennial Film Forum in New York, Filmex in Los Angeles, Canyon Cinemateque in San Francisco, and the Film Forum in Pasadena. Andrew currently resides in his hermitage in the foothills of the Sierra Nevada. 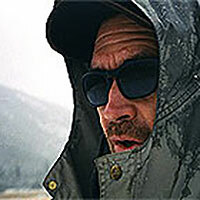 This is the fifth film he has collaborated on with the Karuk.